The world as we now know and inhabit it is imperiled by both nuclear weapons and global warming. No country better illustrates the twin existential threats than the Marshall Islands. LCNP is on the legal team representing the Marshall Islands in its Nuclear Zero cases in the International Court of Justice. And with Foreign Minister Tony deBrum we examined the two threats and what to do about them at a September 20 Climate Convergence workshop held in connection with the Peoples Climate March and the UN Climate Summit. See this eNews for more about these and other LCNP activities. We'll be working hard on the Marshall Islands cases, the 2015 NPT Review Conference, and much else next year. We count on the support of individual donors to make our work possible. You can give online here, or send a check to the address at the end of this eNews. Best wishes for a caring and happy holiday season. In a compelling talk on September 20, Marshall Islands Foreign Minister Tony deBrum explained how his country's experience with US nuclear testing and decolonization gave rise to its willingness - despite its small size - to be a leader on both nuclear abolition and climate protection. (See this August online Newsweek story for more on the appalling nuclear testing legacy.) LCNP's John Burroughs talked about how nuclear abolition and climate protection are both intrinsically global political and legal processes, requiring good faith in abiding by existing international obligations and constructing effective international regimes. In the nuclear arena, good-faith implementation of the nuclear disarmament obligation recognized by Article VI of the 1968 Non-Proliferation Treaty is what the Marshall Islands' Nuclear Zero cases in the International Court of Justice demand. Negotiations on a new climate agreement, to culminate in Paris late next year, must seek good-faith achievement of the objective set by the 1992 UN Framework Convention on Climate Change: stabilization of greenhouse gas concentrations at a level that would prevent dangerous interference with the climate system. Burroughs and deBrum were presenters in a workshop at the September 20 Climate Convergence Conference. It was held the day before several hundred thousand people (including us) were in the streets of New York City for the People's Climate March, and a few days before the September 23 UN Climate Summit, at which young Marshallese poet Kathy Jetnil-Kijiner galvanized the assembled heads of state and high officials with a poem addressed to her infant daughter. "No one's drowning, baby," she promised. Entitled "Deadly Connections: Challenging Nuclear Weapons, Nuclear Power, and Climate Change," the workshop was organized by Western States Legal Foundation (WSLF),together with American Friends Service Committee and LCNP, with support from the Jane Addams Peace Association. Also speaking were our colleagues at Western States Legal Foundation, Andrew Lichterman, on common causes of the nuclear and climate crises, and Jacqueline Cabasso, on ongoing reliance on nuclear weapons. M.V. Ramana of Princeton University explained why nuclear power is not a solution to global warming and emphasized the need for a different conception of economy and growth. Joseph Gerson of American Friends Service Committee described the growing risks of great power war (which could be nuclear). And Frank Cownie, Mayor of Des Moines, and Judith LeBlanc, Peace Action, talked about avenues for political action, local, national and international. The Marshall Islands' filings on April 24 of this year mark the first time the International Court of Justice (ICJ) has been asked to address issues relating to nuclear weapons since its 1996 advisory opinion. In that opinion, largely interpreting Article VI of the NPT, the Court unanimously concluded that there "exists an obligation to pursue in good faith and bring to a conclusion negotiations leading to nuclear disarmament in all its aspects under strict and effective international control." The Marshall Islands' initiative asking the Court to assess compliance with the obligation comes at a time when there are no negotiations on cessation of the nuclear arms race and nuclear disarmament. Indeed, aside from modest US-Russian bilateral agreements on reductions, that has been the case for many years, dating back to the 1996 Comprehensive Nuclear Test-Ban Treaty. Three cases are now in motion, those against the United Kingdom, India, and Pakistan. They are the states among the nine nuclear-armed states which have accepted the general ("compulsory") jurisdiction of the ICJ. The Marshall Islands filed applications against the other states - the United States, France, Russia, China, North Korea, and Israel - and invited them to accept the jurisdiction of the Court in this matter and explain their view of the disarmament obligation. So far none have done so. The Marshall Islands also has a companion case against the United States in U.S. federal court in San Francisco in which it is represented by the US law firm Keller Rohrback. A hearing is set on a US motion to dismiss on procedural grounds for January 16. The ICJ has set briefing schedules in the three active cases. Hearings on preliminary issues relating to whether the cases are suitable for decision by the Court probably will take place by late 2015 or early 2016. See this memo for more on the issues posed by the case and its current status. Peter Weiss, LCNP President Emeritus, and Executive Director John Burroughs are members of the legal team representing the Marshall Islands in the ICJ. The team was expanded over the summer and now includes, among others, Roger Clark, professor at Rutgers Law School, Camden, and a member of the LCNP Consultative Council. For all applications filed in the ICJ, developments in the case in US court, and a petition you can sign, see www.nuclearzero.org, run by our friends and colleagues at Nuclear Age Peace Foundation, consultant to the Marshall Islands. See also www.lcnp.org/RMI and, for developments in the three active ICJ cases, www.icj-cij.org. In August, LCNP President Guy Quinlan authored an LCNP statement, "The United States Should Seek Compliance with the INF Treaty, Not Withdraw from It," in response to the US claim that Russia has violated the treaty. LCNP Executive Director John Burroughs wrote a September Middle Powers Initiative Briefing Paper, "A Beacon of Hope," and made remarks based on the paper at an October UN General Assembly side-event co-sponsored by Japan, the Netherlands, and Global Security Institute. From left, SGI Executive Director for Peace Affairs Hirotsugu Terasaki, IPS Director General Ramesh Jaura, and honoree Jayantha Dhanapala. In September, the New York Times published a story by William Broad and David Sanger, "U.S. Ramping Up Major Renewal in Nuclear Arms." A month later, the US Catholic Bishops Committee on International Justice and Peace released a letter to Energy Secretary Ernest Moniz stating: "The current U.S. plan to maintain and upgrade its nuclear arsenal undermines the quest for nuclear disarmament. The seeming indefinite reliance of the United States on a policy of nuclear deterrence, especially one that includes significant new investments in nuclear weapons, undermines President Obama's stated goal of a world free of nuclear weapons." We could not agree more! 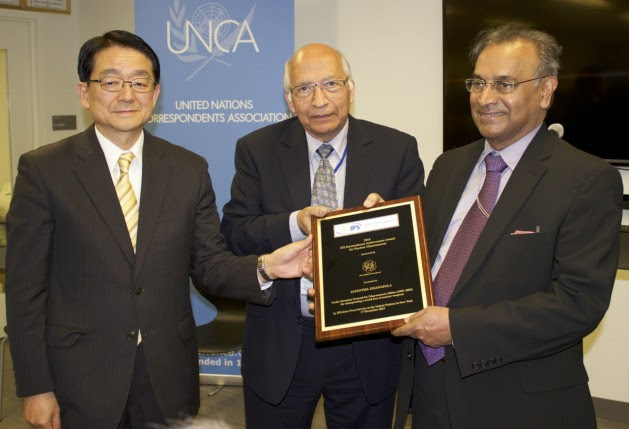 At a November 17 reception at the United Nations, Inter Press Service awarded Jayantha Dhanapala its 2014 International Achievement Award for Nuclear Disarmament. Amb. Dhanapala is a former UN Under-Secretary-General for Disarmament Affairs, current President of Pugwash, and a longtime LCNP friend. In an op-ed based on his remarks at the event, he wrote that nuclear disarmament is "an achievable goal and not the mirage that the nuclear weapon states would have us believe." Words to live by! In case you, your organization, or another in your network may be looking, the Global Security Institute (GSI) has space to rent at 866 United Nations Plaza, a building across the street from UN Headquarters filled with diplomatic missions and UN agencies. The large available office (furnished and with window) is perfect for a non-profit organization focused on issues relevant to the United Nations work (development, disarmament, security, climate change, human rights, etc.). The rent is $2250 per month plus share of common office expenses. One year sublease with renewal possible. We offer a dynamic and diverse policy environment, access to shared common space with GSI, LCNP, and other existing tenants, informal access to diplomats, a good reputation throughout the UN community. Occupancy January 1 or sooner if needed. Contact: Aviva Kushner akushner@gsinstitute.org.